Since we returned from our road trip to the Pacific Northwest, I've been looking at the piles (yes, *piles*) of laundered fabric that was my haul from all the shops we visited. Some I purchased with specific projects in mind, others were bought "just because". But NONE of them were on my existing UFO list ... the list I have been steadfastly trying to reduce for lo, these many years (no kidding on that, either). I knew, *knew*, KNEW that I had this pattern someplace. I had previously looked in all the usual places without success. Then, I rediscovered a storage box tucked into a low bookcase and TA DA! there is was ... along with a LOT of other patterns and supplies that I had kinda/sorta forgotten about. Quite literally .. out of sight, out of mind. 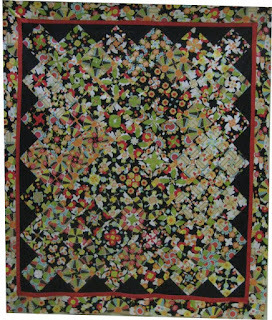 The pattern is "4-Patched Stacked Posies" from HD Designs. They haven't got their act together with respect to their website but you can see the pattern itself over on Amazon. sashing, which I didn't want to do. But I had seen some absolutely fabulous versions with the 4-patches just smooshed up against each other. Maybe I didn't group them as well as they could have been grouped. Maybe my fabric wasn't the greatest choice to begin with. Whatever the reason, the center part of the top, where all the 4-patches are, looks like an incredibly busy mish-mash. I could have achieved this same look by simply using the fabric as-is. Eh .. whatever. It is what it is. 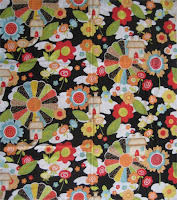 The red inner border fabric and the black setting triangle fabric came from my stash. I've made this layout before; it's a great optical illusion of 3D boxes with shadows. The pattern is "Shadowbox" by Mountainpeek Creations. Interestingly, I couldn't find *my* pattern on their website .. really weird ... but you can see a version of it on Kaye Woods' site. 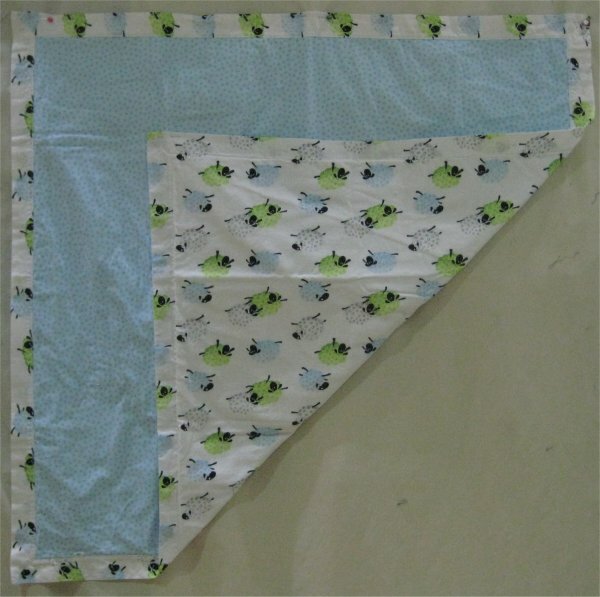 My "focus" fabric was the ADORABLE green & blue sheep fabric. There was also a coordinating blue dot fabric. 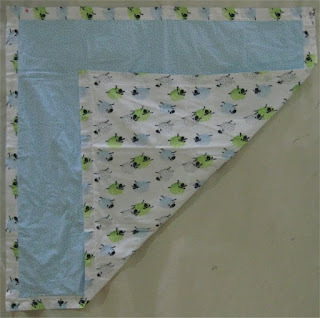 My original intent was to make a self-mitering baby blanket for an upcoming baby shower .. which I did. Hooray! 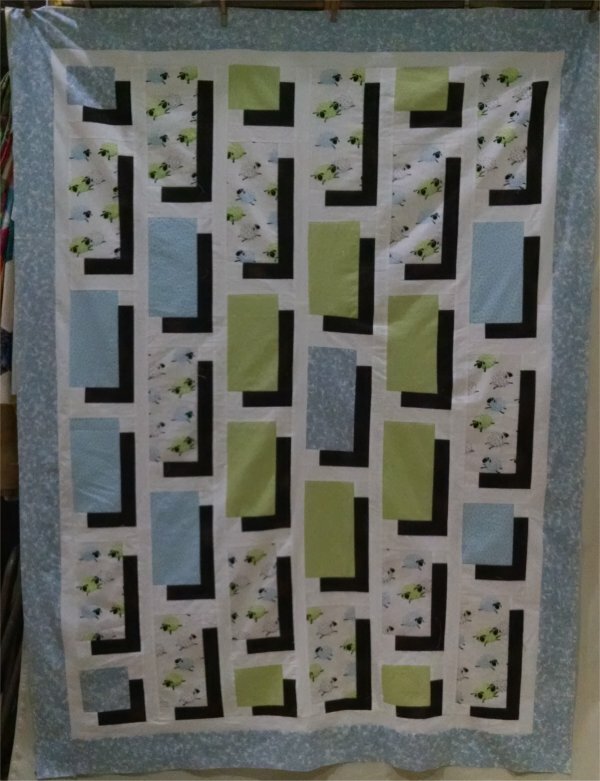 But, I had quite a bit of the fabric leftover, which is where the Shadowbox quilt came in. Although I had many leftover sheep and blue dot rectangles, there weren't enough of them, by themselves, to make a Shadowbox quilt. I augmented with a green flannel. The black shadow, the white sashing and green flannel fabric came from my stash. When I got done with that one, I STILL had some leftover rectangles. I had gotten carried away when cutting the green flannel fabric. 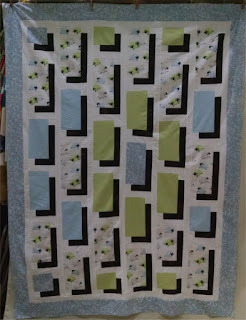 :-) In order to use it up, I made ANOTHER Shadowbox quilt. 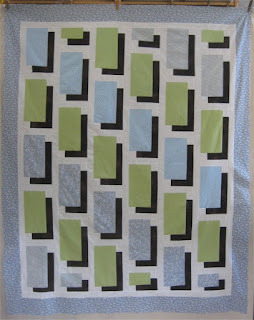 To make the quilt top a useful size, I used some more compatible blue fabric from my stash. 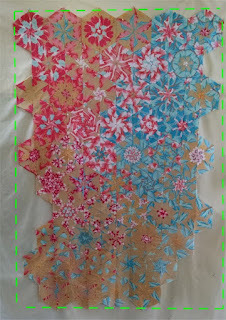 * which leads us to my current, in-progress quilt top: another One Block Wonder but this time with hexagons. Now THIS version is what I had in mind when I was making the first one (with the 4-patches). 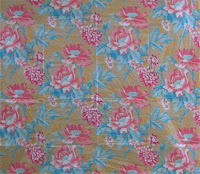 Maybe the original fabric (a Kaffe Fassett print!) was better suited. Maybe the hexagon shape is a better choice. Whatever the reason, I'm very pleased with the way this one is progressing. 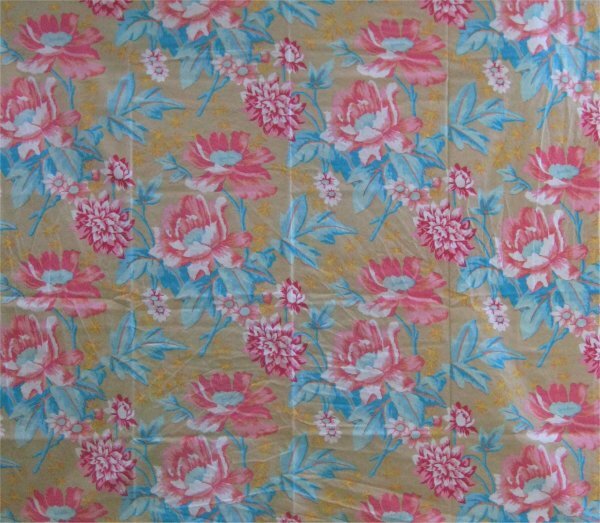 I had bought the rest of the fabric available at the shop, which was about 3-3.5 yards. I thought SURELY this would be enough for a One Block Wonder (of some sort). Well, what I hadn't remembered is that the length of the pattern repeat on the fabric plays a HUGE role in how much fabric you need to make the hexagon version. For hexagons, you need 6 triangles ... i.e. you need 6 repeats of the fabric print because you are going to stack those repeats vertically on top of each other to get your 6 triangles. From the fabric that I bought, I *was* able to get 6 repeats (whew!) and 2 more .. which means that all the hexagons I was ever going to get would be from that single stack of 6 repeats. Depending on how you sew the triangles together, the look of the resultant hexagon will be wildly different. The predominant color will change as the position of the triangles change. You never know how many hexagons of a particular dominant color you are going to get until you sew all the hexagons. So, with the colors that emerged from my hexagons, I moved them all around .. repeatedly! ... until the final result was something that pleased my eyeballs. There is no right or wrong way to group the hexagons; it's whatever looks good to you. When I was satisfied with my final arrangement, there were quite a number of "voids" ... areas where I didn't have any hexagons to be used. 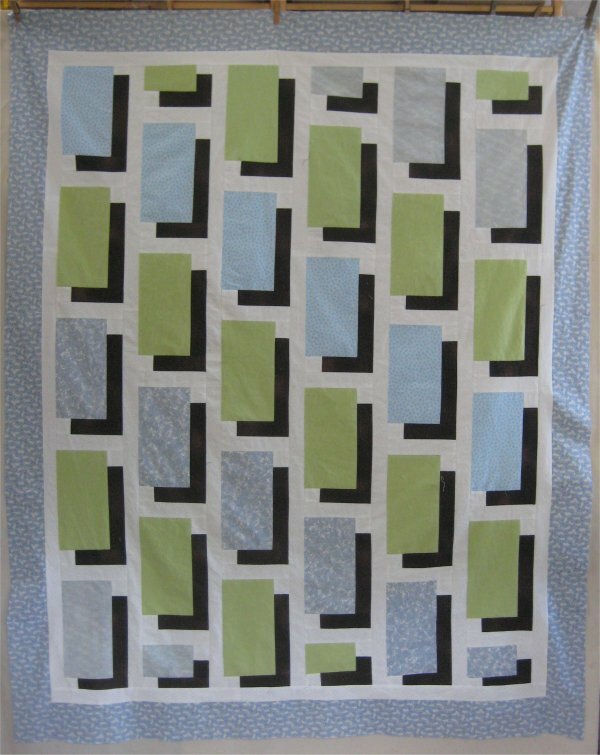 Googling what others had done with their One Block Wonders, I saw where one enterprising quilter had simply appliqued the hexagons on top of the original fabric to fill in the "voids"! WONDERFUL idea! I even had enough leftover to do exactly that! I was very, very pleased! 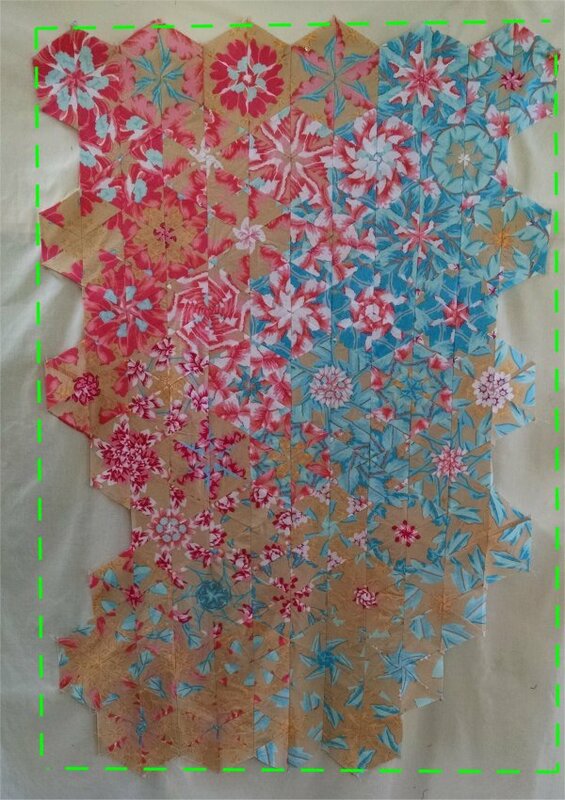 So, here is the version where all the hexagons are sewn together ... the green dashed line shows where I need to fill in with the original fabric. And here is the filled-in version, along with a narrow stop border. This is where I am right now. Since I don't have a substantial amount of original fabric to use as an outer border, I need to think a while to figure out what kind of outer border to put on it. 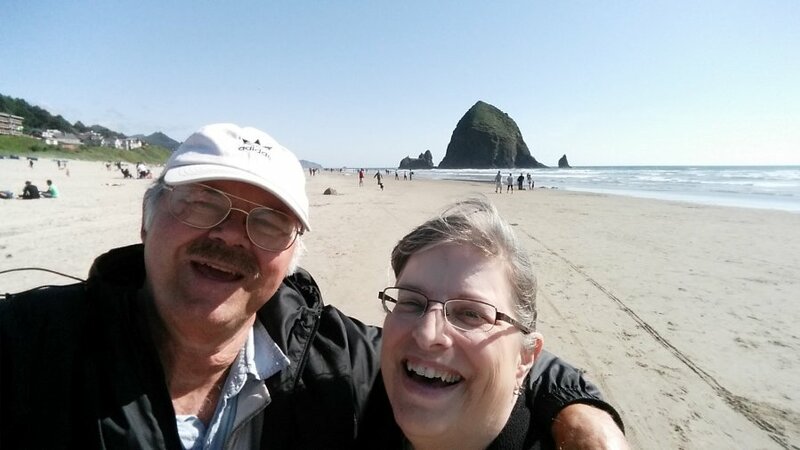 Cannon Beach, OR - a project finished! Recently, Mr. Pirate & I went on a road trip. Mr. Pirate recently acquired a new-to-us, small travel trailer and one of the places we stayed was at the Cannon Beach RV Resort in Oregon. This was just an overnight stay for us, so we didn't have a whole lot of time between the time we arrived in the late morning and the time we needed to be on the road again, 24 hours later. We did relax, have dinner and a campfire. BUT, we made good use of the time that we did have. Specifically .. a quilt store! Yep, Cannon Beach has a quilt store. A very NICE quilt store. Mr. Pirate usually looks for a nearby pub/tavern, as he knows that I can be quite a while at quilt stores. He has resigned himself to this, so he looks for a place where he can consort with the locals in a friendly setting .... and that is usually a pub. And wouldn't you know it? There WAS a pub just a mere block away. Now this isn't JUST a pub. Oh no. By some strange set of circumstances that we never did get a straight answer on, the owner of the pub is also the owner of a hardware store. He decided to join the two businesses. I mean *physically* join them in the same building. You enter one door; to the left through an opening, is the hardware store. To the right, is the pub. 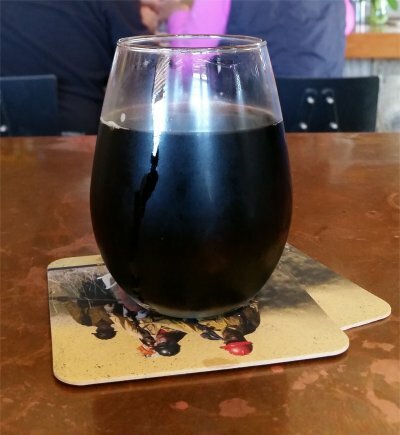 You pay for your hardware purchases at the pub. 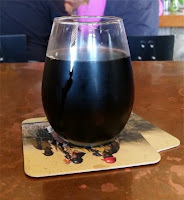 So, while Mr. Pirate whiled away the time over a glass of porter (yuck! yuck! yuck! 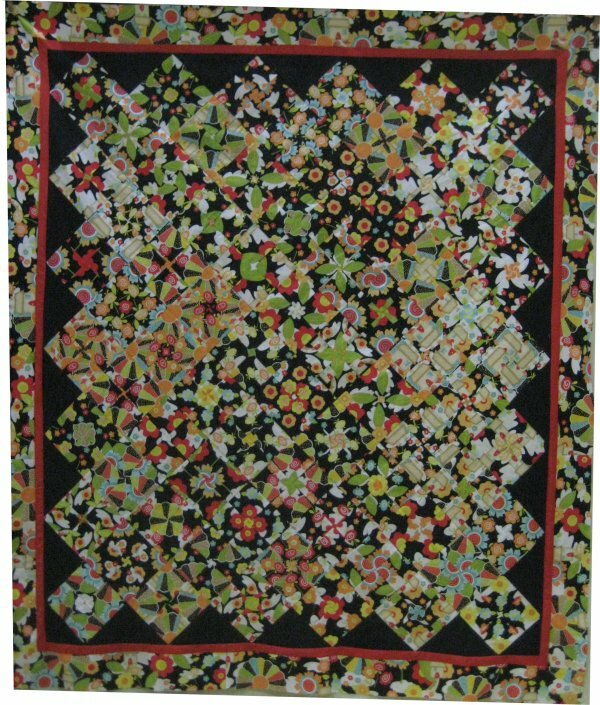 ), I devoted MY time to carefully perusing the inventory of the quilt store, Central Diamond Fabrics. It is a FABULOUS store. The building is long and narrow but inside is an incredible inventory in both fabric and books. Because this is a beach town, the store has a great stock of water and beach themed fabric. As with many other quilt stores I have visited, this one seems to have unique selections in their fabrics. I saw fabrics here that I simply haven't seen anywhere else .. and that's a good thing because it would be ever so boring if quilts stores all had the same inventory. They had wonderful eye-candy hanging up for their customers to enjoy .. both quilts and garments. The staff was very, very friendly without being obnoxious. I wouldn't mind if this was my local store! 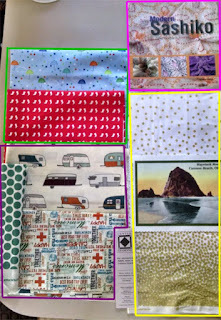 The haul I collected at Center Diamond fabric is shown here: the green bordered box has fabrics that are going to be a body pillow cover for one of my Dear Daughters. If she reads this blog, then she'll have advance notice of what one cover will be. :-) The hot pink block is a book on Sashiko. This Japanese hand-stitched outlines has always intrigued me. It could be an excellent, portable project to work on when I'm away from home. The yellow block contains a digital print of a local landmark, Haystack Rock (For those of you from California, I actually mistook this rock for the one that is in Morro Bay .. they are THAT similar!) 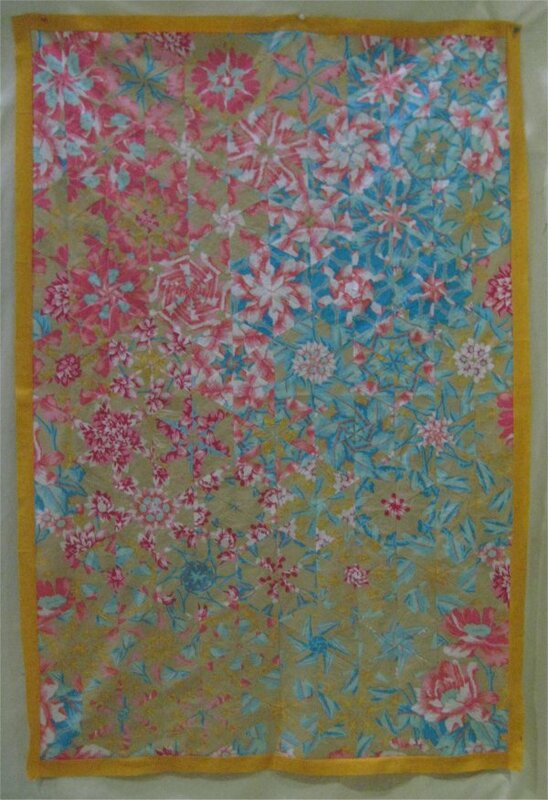 and fabric to make a tote bag. The digital photo print will be an exterior pocket on the tote. That leaves the purple bordered block ... that contains the trailer and travel-themed fabric I bought to make placemats for our trailer. It was impressed upon me, during this trip, that although I have many sets of placemats for use at home, I didn't have ANY placemats ... commercial or home made ... for the trailer. 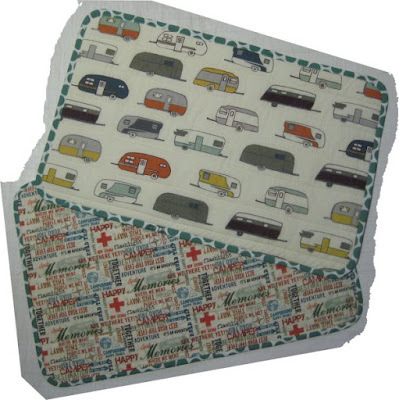 So when I found the fabric with vintage trailers on it, I knew immediately that THIS FABRIC would become placemats for our trailer. The travel-themed fabric was just perfect for the backing. 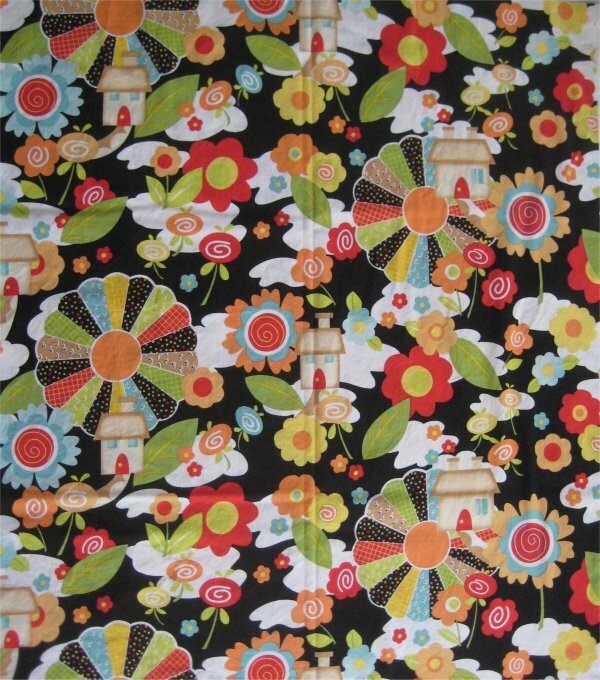 I bought the polka-dot fabric for bias binding. I couldn't start on the placemats until I got back home because 1) I needed to wash the fabric first (I'm firmly in the camp of "wash all fabric before using") and 2) the Insulbrite I would use for the "batting" was at home. 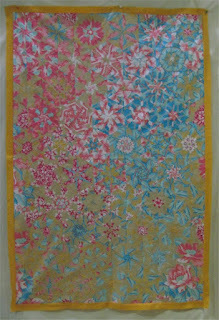 But, once home and all the fabric was washed and dried, I started on the placemats ... and FINISHED them! Woo hoo!! I can't believe that a project *from this trip* has actually been COMPLETED ... within days of us returning home!! And yes, I only made two placemats. Why? Well, it's only Mr. Pirate and me who are traveling in the trailer. The dining table is very small ... two people can sit very comfortably on the opposing benches. Four *children* can sit comfortably on those benches. But more than two adults? Nope ... there isn't going to be any comfort factor at all. Oh .. here's Mr. Pirate & I with Haystack Rock in the background. Now ... doesn't that look like the rock at Morro Bay? ?